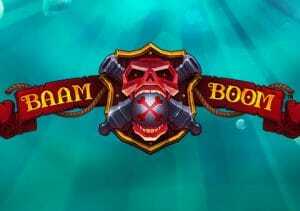 Set sail and go pillaging for doubloons in the pirate adventure Baam Boom. Created by Playtech, it’s a colourful 5 reel, 25 payline video slot that comes with up to 30 free spins as well as a Battleships-style pick and click round. Play on your PC, tablet or mobile from between 30p and £300 per spin. Playtech has created a cracking looking game here. The reels are set within the porthole of a classic wooden pirate ship. Joining the lower value A to 10 symbols are jugs of ale, wooden kegs and flintlock pistols. The crossed cannons symbol is the most rewarding. Land 5 of these on a payline and you’ll receive an award equal to 16.6 times your total bet. The cannonball is the wild. This also offers payouts of up to 16.6 times your payline as well as substituting for all other symbols apart from the skull scatter. That skull scatter pays 5, 10 or 100 times your bet if you manage to land 3, 4 or 5 of them on the same spin. It also triggers the Treasure Chest feature and with it 10, 20 or 30 free spins. Every time a cannonball wild hits during the feature, it’s collected. At the end of the feature, you’ll be shown a 7×7 squared treasure map. Pick a square on the map and fire. If you land on a gemstone, you’ll win a prize. The more wilds you find, the more shots you’ll have. Each treasure map contains 8 prizes. After you’ve uncovered 5 of them, you’ll move on to a new map. There are 5 maps per level and 5 levels to work through with prizes increasing as you go. By the time you reach the final map, the prizes for each hit can reach a mighty 166 times your bet. Bonus feature – this round is activated when you’ll filled the meter above the reels. 1 light is lit every time a wild lands in the base game. Collect 5 and you’ll be awarded a map from the Treasure Chest feature. Take aim with your 5 cannonballs and try and land a prize. You’ll be given hints on where to fire on maps 1 and 2. After your 5 shots, you’ll return to the base game. With its funky design, catchy guitar soundtrack and good range of features, there’s plenty to like about Baam Boom. We found the treasure maps to be really hit and miss. Work your way through the maps though and the gold can mount. The pirate theme is an ever popular one. Baam Boom offers a novel take on this classic theme. If you fancy some rip-roaring seafaring adventure, then it fits the bill rather well. Alternatively, ELK Studios’ Wild Seas is superb.